Hi this is Captain John Leech, I was out with David and Dwyane today. I'm going to put one of them on, because we had just a great day and they can explain it better than I! Lake Toho | Monster Bass Fishing in February! 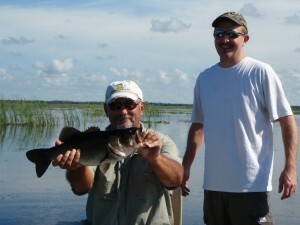 We fished February 8, with Mike Power from Darden Restaurants, Inc in Orlando, Florida. 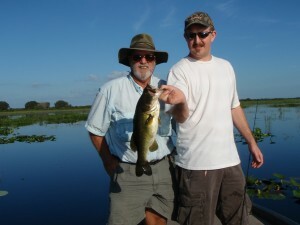 This was there first experience at fishing the big Lake Toho and by the pictures a very good one. BASS ONLINE2016-10-18T14:35:05-04:00February 9th, 2010|Categories: Central Florida Fishing, Florida Fishing Reports, Lake Toho Fishing Reports - Lake Tohopekaliga, FL, Largemouth Bass|Tags: Bass Fishing, Bass Fishing Orlando, Capt John Leech, Capt Kip Grunloh, Capt Steve Niemoeller, Florida, Florida Fishing, Orlando Bass Fishing|Comments Off on Lake Toho | Monster Bass Fishing in February! Orlando Bass Fishing, great fish in November! Jeannie & Bruce Barash from New York were vacationing in Orlando enjoying a local bass fishing adventure. You just know some people are dentin to get blessed by the "all mighty fish gods," no matter how odd or unbelievable the situation becomes the angler prevails. BASS ONLINE2016-10-18T14:35:35-04:00November 14th, 2009|Categories: Central Florida Fishing, Florida Fishing Reports, Lake Toho Fishing Reports - Lake Tohopekaliga, FL, Largemouth Bass|Tags: Bass Fishing, Bass Fishing Orlando, Capt John Leech, Orlando Bass Fishing|Comments Off on Orlando Bass Fishing, great fish in November! Lake Toho for Trophy Bass Fishing in Florida! Ronda and Ed McCoy from Wichita, Kansas came on-board for a bass fishing excursion of a life time. Lori Lupton2016-10-18T14:35:37-04:00October 26th, 2009|Categories: Central Florida Fishing, Florida Fishing Reports, Lake Toho Fishing Reports - Lake Tohopekaliga, FL, Largemouth Bass|Tags: Bass Fishing Orlando, Capt John Leech, Orlando Bass Fishing|Comments Off on Lake Toho for Trophy Bass Fishing in Florida! Bass Pro Shop Winners of Customer Appreciation Rewards Night! BASS ONLINE2016-10-18T14:36:06-04:00September 24th, 2009|Categories: Central Florida Fishing, Florida Fishing Reports, Largemouth Bass|Tags: Bass Fishing Orlando, Central Florida Fishing, Florida Bass Fishing, Orlando Bass Fishing|Comments Off on Bass Pro Shop Winners of Customer Appreciation Rewards Night!